In addition to her writing, she is the CEO of Blondie's Custom Book Covers and the co-host of the popular podcast Blondie and the Brit. My favorite author, Diana Gabaldon, has a book called the Outlandish Companion where she described her somewhat haphazard way of writing a story. It inspired me to give it a try, with the pressure of a structured story removed, and I found my way to the bookstore to find some writing guides. I write in a Romantic Suspense genre, but it’s more of a mixture of Historic Fiction, Thriller, Suspense, Sci-Fi. It involves a lot of elements that I really enjoy writing. Because it’s time travel I get to include whatever points in time I’m intrigued by and it’s set during the hurricanes of 2004 in Florida. 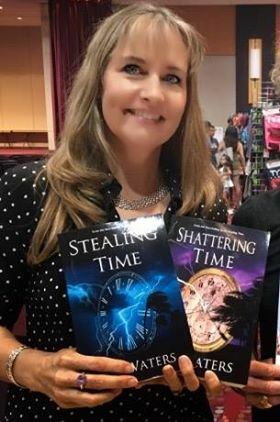 I invite you to check out my Stealing Time Series so you can experience the power of the storm: http://geni.us/guestblogseries. 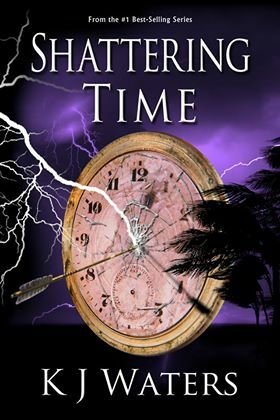 Here is one recent review: Shattering Time is a page turner, and for that reason is a quick read. I definitely recommend it, even to those who never thought they would enjoy time travel fiction. Oddly enough, I only recognized the complexity of the characters after I completed the book and let it all sink in. Once again, Ronnie is transported to dangerous places and plagued with desperate situations, while experiencing perilous cultures including one of America’s first mysteries -- the Lost Colony of Roanoke Island. Please check out my #1 Best Selling short story, Blow, on Amazon here: http://geni.us/guestblog. It has 4.9 out of 5 stars on Amazon. Here is one short review: Action packed short story about the intensity of Hurricane Ivan. I was so immersed in the tale, I had to look up to check that my roof was still there once I had finished. Waters is a great story teller!